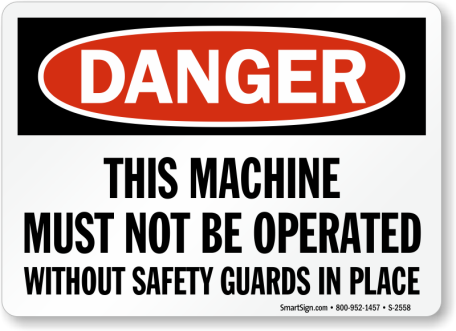 In 2017, machine guarding was cited nationally 1,933 times by OSHA and was ranked #8 in OSHA’s Top 10 Violations. Safeguarding of machines and machinery systems will vary depending on the setup, design, construction, operation, and maintenance of the equipment. An effective measure in controlling hazards associated with machinery is to ensure proper safeguarding. Safeguarding protects personnel from hazards by the use of guards, safeguarding devices, awareness devices, and/or safeguarding measures. When selecting machine safeguarding, a thorough hazard and risk analysis should be conducted. These analyses can help determine methods of safeguarding to provide reasonable safety. A team of individuals may also be assembled to help with the assessment in an effort to provide an understanding of the operation, general work layout, and type of material used. In addition to the hazard and risk assessment process, ANSI (American National Standards Institute) and OSHA (Occupational Safety & Health Administration) have standards and guidelines to help assist employers in determining appropriate safeguarding for machines within general industry. OSHA’s general industry standards for machine guarding are found in 29 CFR 1910 Subpart O, Machinery and Machine Guarding. This section addresses requirements for woodworking, abrasive wheels, mills, mechanical power presses, forging machines, and mechanical power-transmission machines. ANSI B11 standards apply to power driven machines which are used to shape and/or form metal or other materials and are to be used by the designer, the supplier, the modifier, and the user personnel. For further assistance regarding safeguarding or hazard and risk analysis, please contact Robert Ridpath.